Here at MakingEspresso.com, we know how important a perfect cup of espresso is. With such a large selection of brand and models, choosing the right one to suit your needs can be tough. We understand that people today are on the go and entertaining a large group using the right espresso machine can make a big difference. 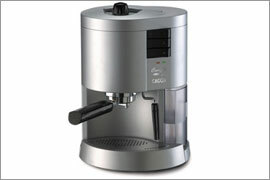 We have created this informative buying guide to explain the functions and features of each type of espresso machine. Alright, let’s get to the machines. Your first option is Super Automatic Espresso Machines, which are the easiest to use, have the lowest learning curve, but are also the most expensive type of machine on the market. The next type of machine to consider is Semi Automatic Espresso Machines, which are the most popular style chosen for home use because they produce an excellent product and are fairly easy to use. Next on the list are Manual Espresso Machines, which are traditional style machines reflecting the original prototypes invented to create a consistent and flavorful cup of espresso. These machines are recommended for true coffee aficionados and those who truly enjoy the process and effort involved in making a cup of espresso. Pod Espresso Machines are perfect for those wishing to eliminate the need to measure grounds and they are very easy to clean. 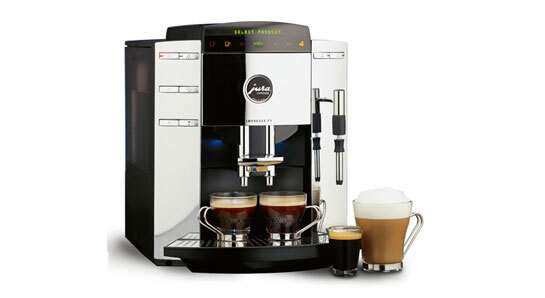 With just the push of a button, super-automatic espresso machines do everything necessary to brew the perfect shot of espresso, latte or cappuccino. They grind whole beans and deposit grounds into the filter, they tamp them and then brew them. Super-automatics have very powerful conical burr grinders with gear reduction systems and lots of settings to control the strength of your brew. Steaming and frothing milk is very easy with the frothing adaptor. These machines are the easiest to use on the market, but they are also the most expensive type of machine. Some people say that super-automatic means less control and lower quality brews, however in actual testing, these machines produce a very consistent and quality espresso. You do lose some control over the brew pressure and tamping pressure, but these things are not necessarily bad and they can be compensated for with other features that allow you to adjust the grind settings, doser settings and serving size. Digital display - This gives detailed information regarding the machine’s functions and settings. Programmability - This is standard in all super-automatics, but there are various settings and options depending on the make and model. Water filtration system - This improves the flavor of espresso and lengthens the life of the machine. 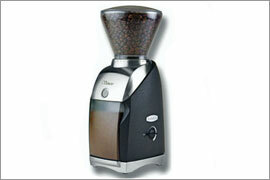 Grinder settings and adjustable doser - This gives you more control over the flavor of your espresso. Does a super-automatic sound right for you? We’ve partnered with EveryEspressoMachine.com and Zaccardis.com to offer you all the greatest super-automatics on the market. Click here to look at some super-automatics! Semi-automatic machines are the most popular style for home use because they produce excellent coffee and are fairly easy to use. The main difference between a super- and semi-automatic machine is that the semi-automatic machine doesn’t grind the beans. Some super-automatics also rinse and clean themselves. Semi-automatics must be rinsed and cleaned by you. Most semi-automatic machines use a boiler to heat water as it passes from a separate water tank, however, some models use a thermoblock system which heats water instantly and reduces wait time. Some have an “On/Off” switch users must push once to start extraction and then must push again to stop extraction. Other semi-automatics only require one push of the button to begin the extraction and then will automatically stop after a pre-programmed time has passed. Frothing with semi-automatics can be simple with some machines but can require some skill with others. This really depends on whether the machine comes with a frothing adaptor or not. The adaptor makes this process simpler for the user while the traditional steam wands that take a little bit of practice to perfect. Uses a thermoblock system to quickly heat water. It can be timed to shut off automatically once extraction has begun. It comes with a frothing adaptor instead of a traditional steam wand. Does a super-automatic sound right for you? We’ve partnered with EveryEspressoMachine.com and Zaccardis.com to offer you all the greatest semi-automatics on the market. Click here to look at some semi-automatics! These old-world style machines look great and reflect the original prototypes invented to create a consistent and flavorful cup of espresso. Also called “Piston-Style” machines, they were the first models to use a hand pump capable of generating the 8 to 9 atmospheres of pressure that is necessary to force the water through the condensed grounds–the way to make a proper cup of espresso. These machines are recommended for true coffee aficionados and those who enjoy the process and effort involved in making a cup of espresso the traditional way. These machines are tough to use and require a higher skill level than the automatic machines. Also, they have a small water tank, making them impractical for large gatherings. The cleaning and maintenance for manuals is fairly straightforward, however the outer finishes, typically brass, chrome or copper, will require special cleaning to remove tarnishing and fingerprints. 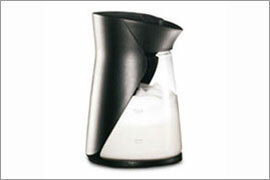 The milk frothers are standard and powerful enough for home use. It’s also worth noting is that pulling down the handle to force water through the espresso grounds does require a bit of arm strength and the consistency of the pull is critical to the espresso quality. They are tough to use and require a lot more attention and skill than the automatic machines. Do you want to check out some manuals? 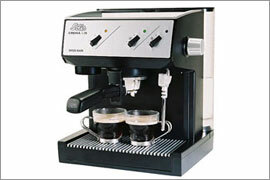 We’ve partnered with EveryEspressoMachine.com and Zaccardis.com to offer you all the greatest manuals on the market. Click here to look at some manuals! Pod espresso machines can be either semi- or super automatic machines. They are called “pod” machines because they use “pods” of prepared grounds that you simply throw away after use. No grinding or tamping. You buy more pods to make more coffee. Something to note is that using pods means you will not be able to adjust the taste of your coffee through the dosage or the fineness of the grounds. Another drawback is that some machines require that you buy their brand of pod, so if you can’t find a pod you love, you’re out of luck. 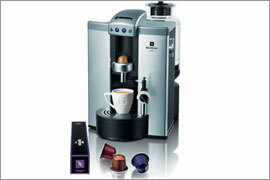 Brands like Nespresso and Tassimo will only function with their own brand of espresso pods. If you don’t want to be limited to just one brand of coffee pods, look for machines that are “ESE adapted,” which means they work with all standard size coffee pods on the market. Does a pod machine sound right for you? We’ve partnered with EveryEspressoMachine.com to offer you all the greatest pod machines on the market. Click here to look at some pod machines! Place on stove to boil water until collection chamber is full of freshly brewed espresso, then pour directly from the collection chamber into your cup to serve. Does a stovetop sound right for you? 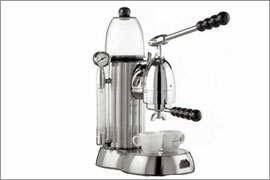 We’ve partnered with EveryEspressoMachine.com and Zaccardis.com to offer you all the greatest manuals on the market. Click here to look at some stovetops! The perfect cup of espresso begins with properly ground coffee beans. If you don’t have a super-automatic machine and you plan to brew whole-bean espresso (the most flavorful way to brew), you will need to buy a grinder. Espresso beans need to be ground to a much finer consistency than typical coffee beans, so you can’t buy just any grinder. High Speed - these grinders feature smaller motors to save on cost and typically deposit grounds into a removable container. They are an relatively inexpensive choice for the less fussy espresso drinker and will grind small doses of beans without trouble. They can bog down under heavy loads and can clog if they grind too finely. Low Speed Gear Reduction - These grinders are quieter and cause less static charge as they grind. The gear reduction transfers less heat to the coffee grounds, preventing scorching and preserving the flavor. They are also less likely to clog than the high speed grinders. Low Speed Direct Drive - These are the heavy- duty grinders. They have the heaviest and most powerful motors and are often considered commercial quality as they can handle much heavier loads without bogging down. Operation is very quiet, they transfer extremely little heat to the grounds and cause virtually no static build up, all of which leads to a better tasting coffee. 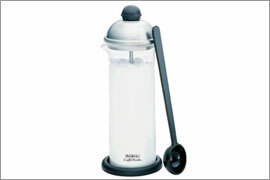 These grinders are very durable and will last for a lifetime. Click here to look at some grinders! Milk frothers are a very easy-to-use kitchen appliance for those uncomfortable with using steam wands or for those who have an espresso machine that doesn’t have a frothing component. All you do is pour heated milk into them and press a button to start frothing. They are very easy to clean and store and they can also be used to create whipped cream for a fun dessert topping! Click here to look at milk frothers! There is a wide range of accessories for your espresso machine, making it even easier to create the cafe experience right in your own home. There are serving sets, cups, saucers, measuring spoons, coffee pods, stands, storage drawers, and more. 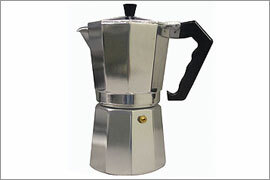 Click here to look at espresso accessories!